Electronic configuration of hydrogen resembles that of alkali metals. 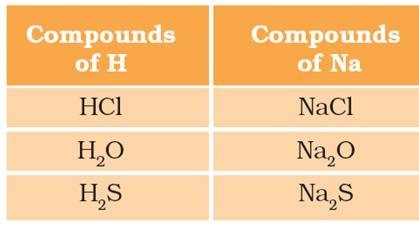 Like alkali metals, hydrogen combines with halogens, oxygen and sulphur to form compounds having similar formulae, as shown in the examples here. On the other hand, just like halogens, hydrogen also exists as diatomic molecules and it combines with metals and non-metals to form covalent compounds. Looking at its resemblance to alkali metals and the halogen family, try to assign hydrogen a correct position in Mendeléev’s Periodic Table. To which group and period should hydrogen be assigned? Certainly, no fixed position can be given to hydrogen in the Periodic Table. This was the first limitation of Mendeléev’s Periodic Table. He could not assign a correct position to hydrogen in his Table. Isotopes were discovered long after Mendeléev had proposed his periodic classification of elements. Let us recall that isotopes of an element have similar chemical properties, but different atomic masses. Would you place them in different slots because their atomic masses are different? Or would you place them in the same position because their chemical properties are the same? Thus, isotopes of all elements posed a challenge to Mendeleev’s Periodic Law. Another problem was that the atomic masses do not increase in a regular manner in going from one element to the next. So it was not possible to predict how many elements could be discovered between two elements — especially when we consider the heavier elements.